In 1893, the World’s Fair was held in Chicago. In conjunction with the Fair, something called the “World’s Parliament of Religions” was held from September 11-27. This was a remarkable gathering, which brought together not only Christian leaders of various denominations, but people of every religious stripe — Jews, Muslims, Hindus, Buddhists, etc. It seems to have been more of a spectacle than anything substantive, although, as we’ve discussed previously, the crazy Antiochian archimandrite Christopher Jabara thought that perhaps the Parliament could come up with a brand-new, global religion. His hopes were unfulfilled. Anyway, besides Jabara, at least two other Orthodox leaders gave speeches at the Parliament — Fr. Panagiotis Phiambolis of Chicago’s new Greek church, and Archbishop Dionysius Latas of Zante (Zakynthos). 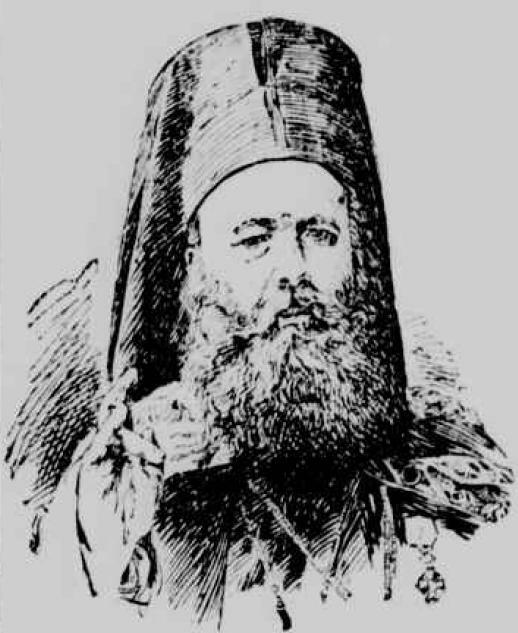 Latas was by far the most significant Orthodox figure at the gathering, and from the time of his arrival in America, he was a media sensation. He also happens to have been the first non-Russian Orthodox hierarch to set foot in the New World. This is the first of several articles that will chronicle his visit to America. Dionysius Latas was born in Zante in 1836. At an early age he attended the Greek Seminary in Jerusalem, where he remained for ten years, afterward spending four years at the University of Athens. Later he studied for a year in the University of Strasburg, before the annexation to Germany, and three years at the universities of Berlin, Leipsic and other German universities, and then spent some time in England. From 1870 to 1884 he was the eloquent preacher of Athens, when he became Archbishop. The chief sensation of Athens just now is a priest named Dionysius Latos, and among the mummeries dinning the ear on every side during these festivities, it was refreshing to find one service that was an exception. This young priest was originally one of the candle-snuffers, a lad of no education, and with no apparent gifts, except a fine rich voice. Promoted because of this to assist in the chorals, he somehow obtained leave to talk or preach, and astonished every one, and greatly captivated the people by his eloquence. He speedily acquired a wide notoriety, and won many friends. Among them was a rich Athenian, who proposed to him to spend three years in the schools of Germany and France, at his expense. He accepted the offer, spent time in diligent application, and has just returned, and is creating the highest enthusiasm. I went on Friday morning to hear him preach, and found the church literally packed. And the Greek churches having no seats, admit of such a crowding as is entirely unknown to American audiences. There was no getting near the main entrance, the throng extending into the street. I found a side door, however, to the women’s gallery, and there at last succeeded, by climbing upon a pile of boards, in getting a view of the preacher and his congregation. Below me was a sea of men’s faces, all upturned toward a man of fine intellectual features, and searching dark eyes, and who in the black gown and round brimless hat or high stiff fez of a Greek priest, stood in a pulpit projecting from one of the columns near the middle of the church. I was impressed at once with the earnestness of the preacher’s face and manner. There was that in the kindling of the eye, the tone of the voice, and the sweep of the hand even, that witnessed unmistakably to the preacher’s deep conviction of the truth and importance of his words. One could not look and listen without a conscious sympathy in response It would have been no common privilege to hear the language of Socrates and Demosthenes spoken, and that in their own Athens, with the distinctness and grace and fervor which marked the speaker’s utterance. Certainly there was a rhythm and music and richness about it that I had never imagined, and that seemed to thrill and move the people somewhat as did the great orators in those earlier days. But when in the course of a fervent passage my ears caught in Greek the words, “Ye men of Athens,” and then following the whole discourse of Paul from Mars Hill, in the very words he used, and under the very shadow of the spot where he stood, I felt as if centuries were suddenly rolled back, and not a Greek priest, but a greater than he, and a greater than Demosthenes or Plato were there before me, preaching in this wonderful language Christ and Him crucified. I could only now and then understand a word, but caught enough to divine that the theme of the discourse was the love of God as revealed in the life and death of Jesus Christ. The preacher continued for a full hour and a half, closing with many quotations of Scripture and with much impassioned eloquence, and the people stood eager to the end. It is believed here by those who know Latos intimately, that he is in every respect heartily in sympathy with evangelical religion. And the hope is warmly cherished that he will prove to the Greek Church in Athens far more than Pere Hyacinthe to the Latin Church in Paris — a fearless and mighty apostle of the truth, that cannot be cajoled from his purpose by flatteries, nor silenced by threats. Latas was a genuine sensation, and as a bishop, he remained a prominent figure in the Church of Greece. He spoke out against anti-Semitism, advocated (as did so many in those days) dialogue with the Episcopalians, and was skeptical that any sort of union would happen with Rome. When he came to the United States, he was warmly welcomed by the various Episcopalian bishops that he encountered. Immediately upon his arrival, he was invited by Bishop Henry Potter to join him at Saratoga Springs. We’ll pick up the Latas story there.